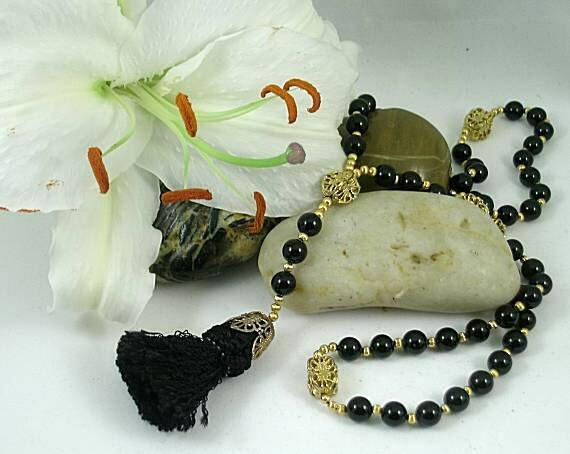 This rosary has five decades of 8mm black onyx ave beads separated by five paternosters (14mm x 10mm filigree gold plated rectangle beads). To make a total of 53 Hail Mary beads, there are 3 that hang down for the pathway. 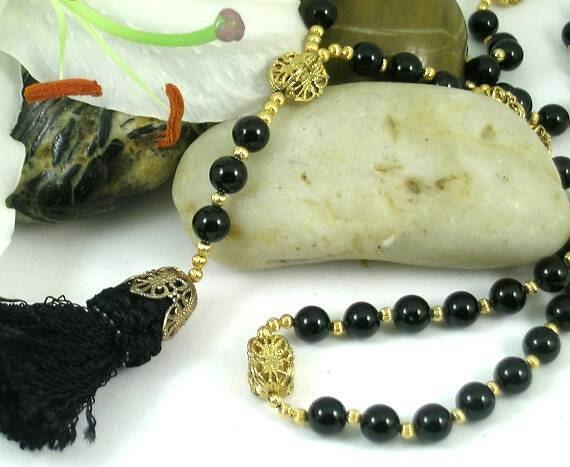 Each bead is separated by a 3mm corrugated metal bead and they are all strung on silk beading cord which is attached to an filigree bead capped 2" black tassel. Folded in half, it hangs approx. 17 inches. Shipped in a velveteen gift box or suede cloth pouch, your choice. Tassels were popular at the end of rosaries before the rosary was standardized in the late 16th century at the Council of Trent.